When a hungry taxi driver pulls over and enquires from our apartment’s security guard about eateries in the middle of the night, he is redirected to a refrigerator installed near the main gate. And to the driver’s surprise, he is treated to a sumptuous home-cooked meal,” says Rahul Khera, a resident of Gurugram’s Suncity Apartments, who takes pride in bringing the community refrigerator concept to Delhi in 2017. He says the concept is simple. Just install a refrigerator where people from a community can store their excess food and anybody hungry can eat from it for free. And it is catching up. “I know there are already four more. There are two in Gurugram at Fresco and CHD Avenue, one in Noida’s ATS Green Village and one in New Friends Colony,” says Khera. 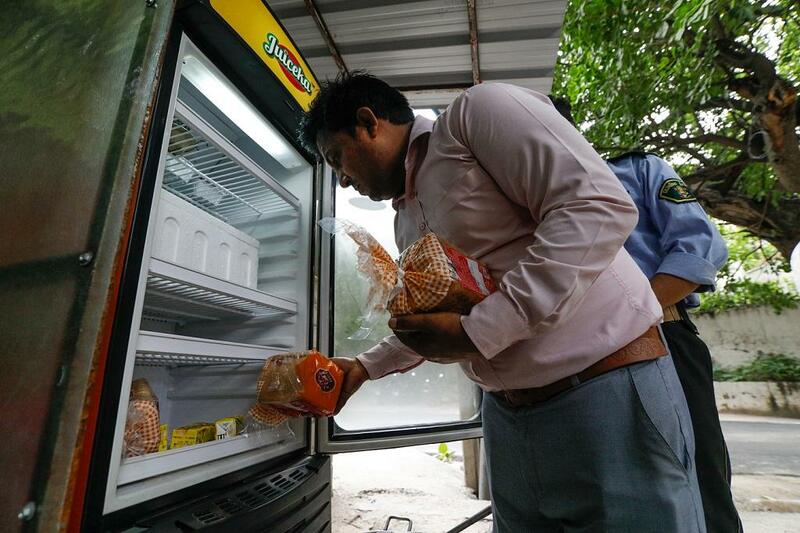 In June 2018, Radio City, along with Mother Dairy, set up refrigerators in four locations in Delhi and the National Capital Region—Maple Heights and Maple Crescent in Gurugram, Rajat Vihar in Noida, and Atulya Apartments and Aravali Apartments in Delhi. “We ran a campaign for 15 days after which we gave the refrigerator to the respective resident welfare associations (RWAs) free of cost. The societies are located in highly populated areas,” says Shubhra Bhramar of Radio City. The concept has been taken a step further by Chennai-based non-profit The Public Foundation, which has installed a closet next to its community refrigerator to store used clothes, shoes and even toys for the poor. Started in 2017, the non-profit has already set up four refrigerators in Chennai and one in Bengaluru. “We currently feed over 100 people daily. I also receive calls from people eager to set up similar refrigerators in the two cities,” says the non-profit’s founder Issa Fathima Jasmine. Ankit Kawatra, founder of Feeding India, a non-profit that collects food from donors and distributes them at their centres in over 45 cities, says community refrigerators have an inherent advantage. “A lot of food gets wasted in transportation. This is minimised through community refrigerators,” he adds. The food inside the refrigerators differ from community to community. “We usually have a mix of food items, which can include packed food, cooked food and even raw vegetables and fruits,” says Khera. Manju Shishudia, president, RWA, Aravali Apartments, says while the Radio City team kept only packed food such as bread, curd and milk to maintain quality, the society now also stores cooked food. At Atulya Apartments in Dwarka, one can find both vegetarian and non-vegetarian food. The food is usually supplied by the residents. “Earlier I used to distribute the extra food among the maids or drivers, who already have enough. Now, the food goes directly to the hungry. It feels wonderful,” says Purnima Sareen, who has contributed apples and biscuit packets to the refrigerator installed in New Friends Colony. Her neighbour, Nandani Bharatiya, makes extra chapattis and sabzi everyday to be kept in the refrigerator. So does Manav Seth, treasurer of the RWA, who contributes food that can feed four to five people everyday. Ritu Kumar, manager of New Friends Colony, says two restaurants have also started supplying food for the refrigerator. “The Friend’s Club Coffee Shop gives food for six to eight people every afternoon. Chinese restaurant Lotus Pond has joined the initiative ,” he says. All communities follow broad guidelines which include labeling each food item with the dish name and its date of cooking. Some are going a step forward. At New Friends colony, the food is packed in disposable foil boxes that are currently supplied by Bharatiya. She also maintains a register that has the name of the contributor and the dish, among other things. “A box costs around Rs 2 and a pack of 50 usually lasts two-three weeks,” she says. ATS Green Village, which also uses foil boxes, is trying biodegradable banana leaves to store the food. Members of the communities say the concept can easily be replicated elsewhere as it is economical. “We started with a second-hand refrigerator bought online for around Rs 8,000. Add to this 150-200 units of electricity a month. In our society it is borne by the builder,” says Khera. Bharatiya says that while she funded the second-hand refrigerator in her society, other residents chipped in to build a platform and a roof to install it. She adds that the electricity cost is split among the residents. Birander Khati from Rajat Vihar in Noida says the running cost comes to Rs 4-5 a family a month in our society. 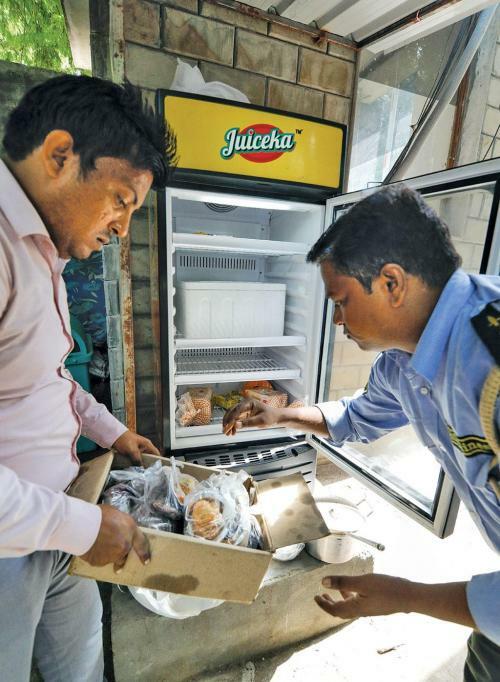 Jasmine, who has installed the refrigerators at public places, says she has spent roughly Rs 1.2 lakh to set up each of the four refrigerators. “I spend another Rs 15,000 a month on its maintenance and security,” she adds. Ahem Raja, a gardener at ATS Greens Village, says he has stopped getting food from home. “Most of the maintenance staff now eat from the refrigerator as the quality is good. Even the people employed in nearby residential societies come here for lunch,” he says. ATS Greens Village resident, Nikhat Tyagi, says the refrigerator is also frequented by the residents of the nearby Gejha village. She adds that the initiative has helped develop a beautiful bond with the village people. Kawatra says his non-profit is planning to experiment with the concept as it has a lot of potential in India where over 20 million people sleep hungry every night. It has helped reduce food wastage in the UAE, Germany and France. In fact, the UAE also has an application to find refrigerators in an area. “India should look at such a plan. But for that we need to popularise and scale up the initiative,” says he. (This story was first published in the 1-15th October issue of Down To Earth under the headline 'A bite of goodness'). Wonderful ideas!!! Need to replicate in small cities too.